One of the most common questions we get about our Essential Oil Blends is whether or not they are “food grade” and pure enough to use internally. We have a hard time answering that question because the answer is yes and no! As with all of our products, our Essential Oil Blends are made with the purest ingredients available so they would be considered ‘food grade’ but we never suggest ingesting essential oils without guidance from a licensed medical practitioner, especially not a proprietary blend. Essential oils are extremely concentrated—imagine drinking 30 cups of peppermint tea in a single gulp, that’s the potency of one drop of the peppermint essential oil (and since all essential oils aren’t created equally, that number could be even higher). That’s some seriously potent medicine and absorbing it all at once could be too much of a good thing. We don’t know very much about our great, great ancestors but one thing we know for certain is that humans have always loved plants that smell good. Some of the earliest known human remains, dating back about 60,000 years, were found with aromatic plants and concentrated extracts from medicinal allies that we still use today like yarrow and mallow (this kind of blows my mind and reminds me that we evolved with the plants). The first written instruction for distillation of essential oil is from around 2000 BC in the Charaka-Samhita, one of the two surviving Sanskrit teachings of traditional Ayurveda. All around the globe, traditional people were cooking, steaming, pressing yummy smelling plants to increase their potency and make them more effective for healing. Essential oils were used often in the mainstream medicine of the 17th century and even Shakespeare wrote about being perfumed because it seemed a common knowledge that a foul smell carried disease. Before the advent of penicillin, we saw essential oils like thyme, clove, and lemon used to treat gangrene in World War I. 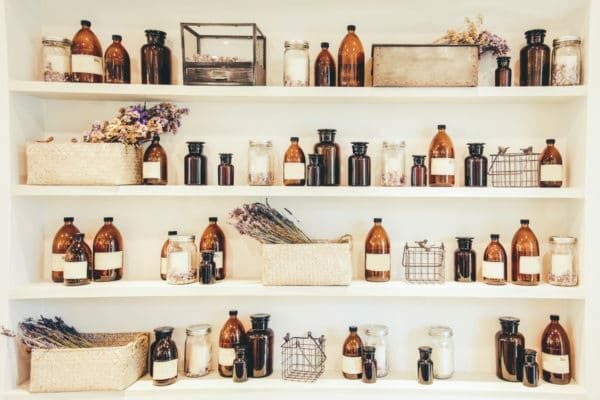 Although herbalism and other forms of traditional medicines have been marginalized by insurance and pharmaceuticals for over a century, it’s impossible to remove the draw of olfactory stimulation from the likes of humanity so when the first aromatherapy clinics were opened in the 1960s by a European nurse, people started taking notice. From that humble beginning, students and researchers took it to a new level with essential oils and aromatherapy becoming a recognized medicinal practice in England. When I read the history of essential oils, I noticed that all of the medical history around essential oils is centered on the doctor-patient relationship. There’s a bit about the UK putting out a warning about the dangers of a perfumed woman but for the most part, when essential oils have been indicated, especially for internal use, it has always been administered by a healer. Further, the different types of essential oil users have been broken down into aesthetic users, holistic users, and clinical users. Aesthetic users are like you and me, we love the smell of essential oils—we want to smell good, we know that the scent of lavender is calming and that sage is cleansing. We have read up about it on our own time and have an interest in using essential oils personally but we don't use the oils undiluted or administer it to ourselves for medicinal purposes. A holistic user is a practitioner that sees the value in using essential oils with their clients. They adhere to the safety rules with essential oils so they may add them to a massage oil or make a smelling salt blend or even suggest a good blend for a client to add to their bathwater but they don’t add essential oils to their internal formulas. The only kind of users that are qualified to use or prescribe essential oils to ingest is a clinical aromatherapy practitioner that is also a physician. It takes a long time to learn the proper dosages with undiluted essential oils because they’re such concentrated forms of specific plant constituents and although the body of research is growing, it’s also consistently changing and physicians do focus on continuing education throughout their time practicing. When it comes down to it, we’re not adamantly opposed to using essential oils internally by any means! There have been amazing results using essential oils as internal medicine and if someone is sick, we think that seeking a holistic physician to offer guidance to the right essential oil at the proper dosage is a great idea. What we don’t think is a good idea is choosing individual oils or blends and dosing yourself or others until you’ve been properly trained by a qualified physician. Simply put, essential oils can damage your body. We think of plant medicine is safe because it’s made from nature but anyone that spends a lot of time in nature will tell you – she’s a tough beast and our safety isn’t her concern. Rather, it’s evolution and the human species’ ability to adapt and change that makes plant medicine effective for us. Essential oils are a concentration of nature, it’s a removal of nature’s buffers (like plant matter and water and most water soluble parts) and the process of creating an essential oil does turn into a different type of medicine. It’s not quite the same thing as extracting salicylic acid and making aspirin from willow, because you’re not pulling a singular compound but it is similar in that you’re removing everything except the mixture of constituents that make up the volatile oil of the plant and that’s a whole lot of power to put directly into your body. There are hundreds of constituents in an individual essential oil and we don’t know how they all interact with each other or our body chemistry so exercising caution with this medicine is smart. If you’re inhaling or using an essential oil topically in a carrier oil, the absorption rate is slow and not everything can permeate the system so even though it still has an affect on the body and it’s possible to overdo it, it doesn’t need to be as carefully regulated. When it comes to ingesting essential oils (and when you’re ingesting any kind of medicine, vitamin, or supplement) it is vital to think about how it’s going to be removed from the body later. What will it do to the internal structures of our bodies? We’re resilient but our organs of elimination (liver, kidneys, lungs, skin) are individual systems that are interconnected and codependent. They’re working together to clear us out and if one organ is sluggish, the other organs pick up the slack. Regardless of your method of application, essential oils are usually excreted by the kidneys, skin, and lungs with the kidneys take the brunt of this type of detoxification—remember when we talked about the Science of Scent and we learned that the kidneys use olfactory receptors to ‘sniff’ out toxins? Kidneys in action! As a general rule, if the kidneys are excreting something it’s in the bloodstream and if it’s in the bloodstream the liver played a hand in that detoxification too. When we use really potent medicine of any kind, it can be overstimulating to the liver and the kidneys and that can cause lasting tissue damage over time. Essential oils are no different. This can be a difficult concept to understand because an essential oil, like an antibiotic, is immediately effective for many ailments but the symptoms of a damaged liver or kidney don’t show up right away. Think about it, we have a million nephrons in each kidney, each nephron is an individual blood scrubber that separates toxins to remove in the urine from the stuff to keep in the bloodstream. There are a lot of really potent individual constituents within a single essential oil (let alone a blend) and those constituents are passed through the kidneys, which can wear out the nephrons and those don’t grow back once their rendered useless. That puts the weight on the other nephrons and on other organs of elimination to clear out the body. See how that could be a progressive issue that could take a while to show up? That’s why we shy away from advising people to take essential oils internally. When we’re approaching health and healing, we always want to take a long term approach. There’s a time and place (and practitioners) for essential oil use internally. I had a teacher that put it into perspective for me by saying, “I have to be so sick that I’m willing to take the kidney punch,” and that has been a helpful (and entertaining) nugget of wisdom that I’ve held onto. Maybe it’ll help you too! When do You Use Essential Oils Internally? Tell us below!